Dramatic photographs show how three drivers had a lucky escape when a tree fell onto moving cars near Wisborough Green on Boxing Day (Saturday December 26). The vehicles were badly damaged after the tree fell onto the B2133 Adversane Road, near Fishers Farm, at about 11am, but no one was injured. 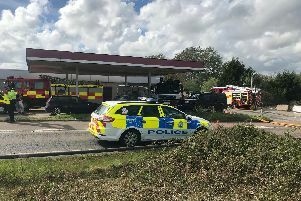 Motorcyclist Stuart Scarry, who was among the first people at the scene, said the drivers ‘could easily have been seriously injured or killed’. He said: “It is easy to exaggerate these local stories for effect but this really was one of those incidents where three could easily have been seriously injured or even killed. “It wasn’t particularly windy that day but the tree was on a high spot, was old and had probably taken some punishment from the elements in the days leading up to its demise. Stuart runs www.dieselbike.net, an alternative motorcycle website, and was heading to the website’s annual rally at The Wisborough pub in Newpound Lane on the morning of the incident. With plans to meet friends at the pub at 11am, he first drove past the tree ten minutes before it fell. But when his friends didn’t make the appointment, Stuart rode back and saw a taxi driver slowing traffic on a nearby bend. He said police arrived on either side of the fallen tree and closed the road. He added that an elderly woman suffered a cut to her hand but no one was seriously hurt. A spokesperson for Sussex Police said there were no reported injuries.